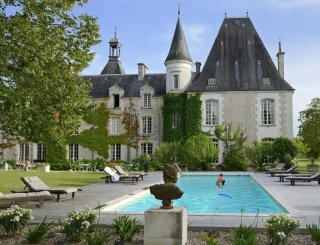 Chateau de la Couronne, Angouleme, Charente, France, sleeps 10-26 in 9 bedrooms. "What Rock Star or Fashionista could be disappointed by cutting edge design, a private cinema, a billiard room and bathrooms with twin bathtubs?" The Times. "Kick your shoes off comfy". Grazia Magazine. "Classic fairy-tale exterior that Tinkerbell would be proud to wave her wand over” The Irish Times. 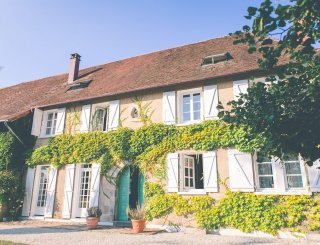 "One of the five best houses to rent in France" The Guardian. With such testimonials the most surprising thing is just how cost-effective hiring the Château is. Brilliant for families, a family reunion or group holiday, there's a warm welcome for everyone. A creative and stylish fusion of ornate stone castle and super-chic interior design, it’s an oasis of space and light. Set in five acres of private grounds, it boats formal gardens, mature trees, a 14.5m heated swimming pool and loads of terrace space with tables and parasols. All the salons have French doors to the terrace, so the whole can be opened up to provide a flexible and relaxed space to relax. Accommodation for up to 26, big, airy salons, private cinema, billiard room – the facilities are extensive. There are five salons, one with a bar which can be stocked prior to your arrival, or provided dry for you to fill with your own purchases. Another salon contains a baby grand piano which guests are encouraged to play, and another is a library with a good collection of books all for guest use. There is a huge dining hall with honey coloured, exposed stone walls - beautifully furnished and warmly lit for evening meals - and next to this is a spacious professional standard kitchen for budding chefs to create memorable meals in. 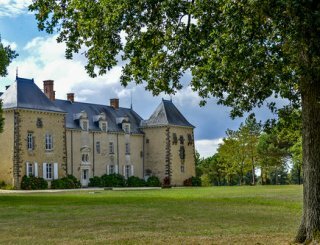 But if that sounds like too much work, the Château can supply flexible catering, from a single celebration dinner to meals every day. You decide. Massive bedrooms provide accommodation for up to 26 guests, all in individually designed and furnished luxury, all equipped with flat screen TV and DVD players and studded with interesting and beautiful art and objects. The bathrooms are all indulgently elegant and spacious – some with two tubs, some incorporating the Château turrets, all with bathing products, big fluffy towels and Château bath robes. The spacious kitchen is a space for everyone to play Jamie for a few days. Extensively equipped with everything you need - and then a bit more. Spectacular dining hall with subtly lit, exposed stone walls and rustic furniture, and tables large enough to seat all your guests at once. Five salons with gorgeous original features, creative, delightful decoration, wood burners and French windows opening to the rear garden and terraces. Private cinema with 9' screen, surround sound, satellite TV and extensive DVD library. Every bedroom has flat screen TV and DVD player. Billiard room with full size, slate bed American pool table. Table tennis table in the garden. 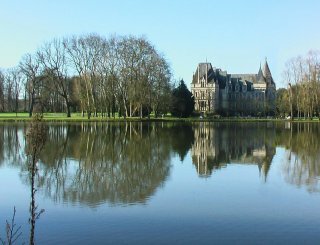 There is heating throughout the Chateau, with open fires / wood burners in various rooms. Nine huge en-suite bedrooms. 7 doubles, 1 twin, 1 quad. There are 6 additional beds and 2 cots which can be arranged in any of the bedrooms. All linen is provided and excellent quality. Egyptian cotton bed linen, bathroom towels as well as dedicated pool towels. Bathrooms are all enormous and decadent, some with two tubs, some incorporate the Chateau Turrets. Bathing products and fluffy bathrobes provided. There are no disabled facilities. Anyone with limited mobility should contact the Chateau for advice before booking. When they discover Disney's "Frozen" or Harry Potter on a 9 foot HD private cinema screen, the problem will be getting them back out again. Five acres of private grounds, with terraces, tables and parasols, mature trees providing dappled sunlight, even a football pitch for the energetic. 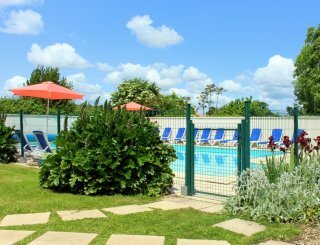 14.5m x 6m heated pool, with sunbathing terrace and sun loungers, walled and secured with entry system for child safety. Although we do love pets, we cannot accommodate them at the Chateau. Sorry. 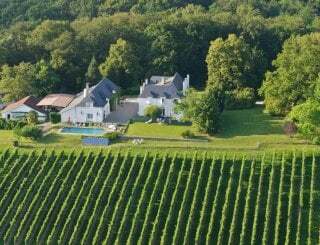 Marthon is a tiny village on the border of the Charente and Dordogne departments. 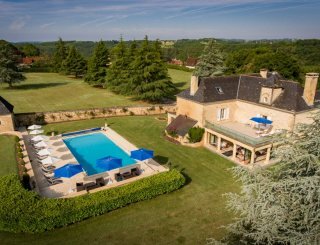 The Chateau sits right on the edge of the village, so it is close enough for guests to feel part of village life. Marthon has a Baker for your early morning Croissants, a Butcher, a general store, Pharmacy and Tabac, as well as a local Cinema and a Doctor - there's even a Physiotherapist! Minimum hire period is 2 nights except July and August when the minimum hire is 1 week. Angouleme TGV, 25km (TGV train Paris to Angouleme takes just 2 hours 13 minutes). Rural buses in France are few and far between, and not to be relied on for travel around the countryside! Angouleme 24km, Limoges 83km, Bergerac 100km, Poitiers 140km, Bordeaux 145km.